High Capacity, 7.9 Cu. Ft. The Cary Super Vac System is designed to provide years of trouble-free service and continuous duty in industrial applications. 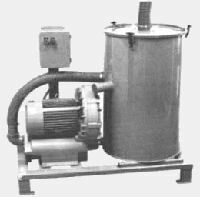 Two versions are available, the portable unit which is mobile and can be moved to any location and the stationary unit for central vacuum headers or limited area cleanups. 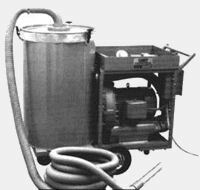 The Cary Super Vac Systems were designed and developed for efficient cleanup and removal of lightweight waste. The systems have been used to pickup and clean areas of: textile waste, fibers and lint, fiberglass, crumbs, cereals, sawdust and wood chips, including dust and dirt. The vacuum receiver filtration is accomplished by a canton flannel (cotton flannel on canvas) filter bag with a filtration area of 2400 sq. inches. The filter bag is clamped into the receiver and is supported by a perforated cylinder. Disposable/reusable bags also provide filtration and are placed inside the canton flannel filter bag. The vacuum receivers are "top-loading." The waste products are collected in 10 mil Cerex disposable/reusable bags. The bags are lifted up and out to empty.